This morning—Monday morning–early, I climbed up the front steps and walked across the porch of the Upshur Parish House. I wasn’t certain how I felt or what to expect on this first morning back as Director of Upshur Parish House and Crosslines. Earlier this spring, I left Buckhannon for a three-month renewal leave. After 29 years under appointment as a United Methodist Pastor, it was the right time. I spent much of my renewal leave in Germany, a country where I have spent time before. Two other occasions I have been captivated by the people, the towns and villages, the cities, and the countryside. When I was 19, my college choir sang our way across Europe, heading for a very small village called Misenheim, where the highlight of our trip was to occur. Singing in a beautiful, old church, with the notes of the German composer, JS Bach’s Magnificat, echoing around the walls and falling on the ears of those in the congregation, is life-giving for the performer and the listener and is an experience that I have never forgotten. Last summer I traveled through parts of Germany with my oldest, Ethan and a good German friend, chasing Martin Luther and the history of the Reformation and, then, exploring Berlin. Each evening as we gathered to talk, often in an outdoor café, I closed my eyes and listened to the sounds of life all around. I love listening to the cadence of the German language, despite the fact that I know so little of it. In gentle whispers and windswept moments, the language engulfed me and reminded me that deep inside, coursing through my veins, is the DNA of my German ancestors and for years, I have heard them calling me home. These German experiences are near and dear to me. 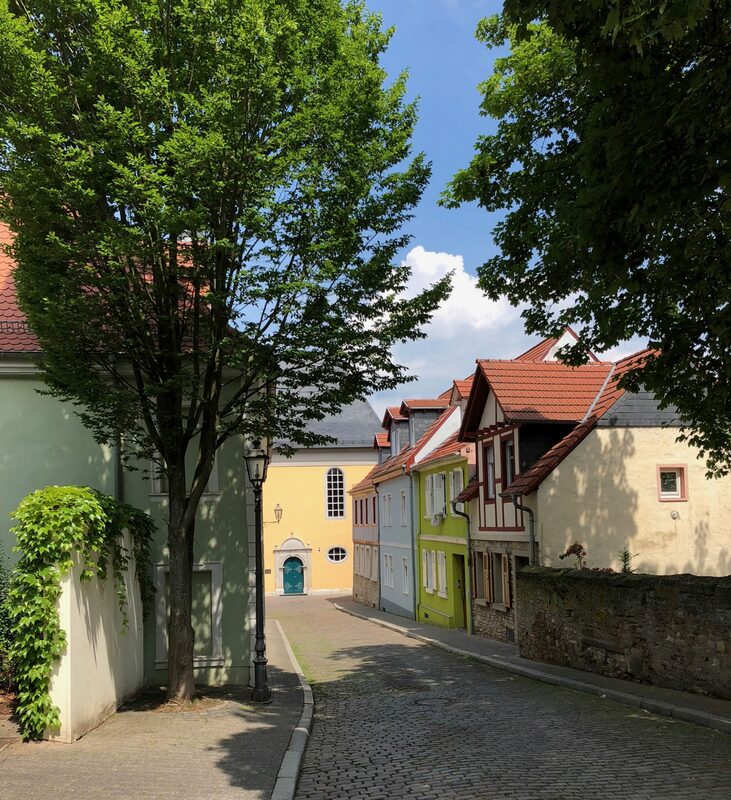 So, as I began to plan for my renewal leave I knew that I wanted to spend time there, exploring the area of my ancestral home, Alzey, in the Rhineland, where my ancestors left in 1709 as starving Refugees, traveled through Europe and eventually settled in the colony of New York. I had also been captivated by Germany accepting Refugees and as I knew that United Methodist churches in Germany were welcoming Refugees, I wanted to spend time with these folks to get a sense of what Refugees might have to face, in the time of my ancestors and now. And so this is what I have doing for three months—spending time with my Refugee ancestors, spending time with Refugees, and reflecting on historical and modern stories. This time has given me the opportunity to reflect on my call as a United Methodist pastor, my work as the Director of the Parish House and Crosslines, and on new possibilities that might be included in my ministry. Spending time in Alzey, where my ancestors lived long ago, gave me a deep appreciation of the suffering that led to their leaving and the sacrifice of what they left behind. Never have I experienced a more stunning spring and it was even more beautiful to me as I realized that this was at the same time of the year that my ancestors left their vineyards and farms for some place unknown in order to survive and thrive. Spending time with the Refugees was good for me as well. Their stories are deeply sacred. Their experiences are difficult to hear at times, but their hope for the future is powerful. They loved that I would sit for long periods of time listening to them. They were good for me because they kept telling me that I am beautiful and have a kind face and a heart of peace! A selfie with some new friends at the Peace Church United Methodist in Göppengen, Germany. Pictured here are Germans, Iranians, and me, the lone American. This time away has been renewing and life-giving and, if I am honest, I was not ready to come back. But today was the day. So, this morning I walked up the steps and across the porch. I reached the door and took a deep breath. I walked in and the first words I heard were an excited: “She’s back.” Suddenly, I was overwhelmed with a feeling of deep gratitude. This renewal leave has been life changing and life giving for me, but many people worked very hard so that the Parish House and Crosslines and the ministries that occur in this space could continue without me. Rev. Gary McGrew and the staff and volunteers and board members, too numerous to name here, worked hard to make certain that the vital ministries and services were still provided in my absence. Our WV Annual Conference and the Wesleyan District provided support as well. In my absence, new projects were started and completed, grants were written, funding requests submitted, presentations made, food prepared, emergency services provided, and numerous other services were offered that improve the quality of life in our community. It was oddly comforting to know that the Parish House and Crosslines could do without me. It was equally gratifying to be welcomed back with hugs and best wishes and flowers and really good coffee. And it was wonderful to be shown around the facility to see the new building, spaces better organized, and to greet the staff and volunteers. There was even a new chair for me at my desk. Spending time in Germany was a time of deep reflection and purpose and I am not certain of all the possibilities that will come of my time there. However, this morning, after turning the doorknob on the front door of the Parish House I knew that for today and for many, many, days to come, the Parish House and Crosslines is the right place for me. I am grateful for all those who made my time away possible. Truly, I am grateful.